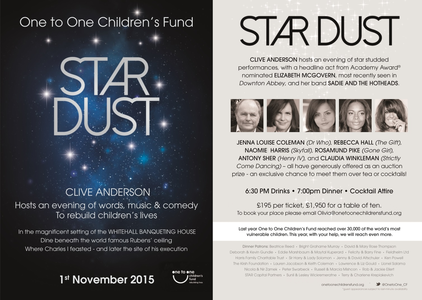 See Downton Abbey star Elizabeth McGovern and her fabulous band Sadie and the Hotheads raise funds to help rebuild children’s lives by headlining One to One Children’s Fund’s gala Stardust on November 1st. The band will play under the magnificent Rubens ceiling of the Banqueting House, Whitehall. Guests will enjoy a thrilling range of performances and delicious food at the gala, hosted by Clive Anderson. The first 20 Downton Abbey fans to book a place can get tickets at half price, so email olivia@onetoonechildrensfund.org and book now! One to One Children's Fund works with some of the most vulnerable children in the world, helping them to deal with disease, trauma and disability, and giving them the opportunity to lead fulfilling lives.